The problems that can arise from having dental veneers and the importance of understanding the risks before veneers are considered. Many people are attending dental practices to obtain the ‘perfect smile’ and veneers are a quick way of achieving this. However, some patients may experience problems with veneers and can be left suffering pain and with dental problems that they did not anticipate. 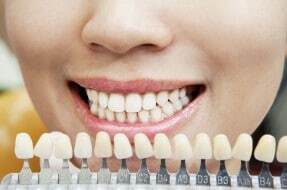 Veneers are thin shells of porcelain made to fit over the front of a person’s natural tooth/teeth to ultimately improve their appearance. Veneers can be used to correct uneven teeth and teeth which are discolored and therefore they are a popular choice among those wanting to change the appearance of their teeth. Whilst veneers are a good way to improve a person’s smile, they do not last a lifetime and will require replacing. Before veneers are placed, the dentist should first ascertain whether a patient is a suitable candidate for veneers and the dentist will need to examine the patient’s teeth and x-rays and impressions may be taken of their mouth and teeth. If the dentist thinks that veneers are suitable the next steps will be the preparation of the teeth that are to have veneers. In order to do this, the dentist will need to remove some of the enamel from the tooth surface and this may be carried out under local anesthetic. Impressions will then be taken and these will be sent to a dental laboratory for the veneers to be made. Once the veneers have been made and the dentist has checked that the veneer fits correctly, the veneer will be cemented to the patients tooth. There is no going back once veneers have been fitted. As I said earlier, the veneer will also not last forever and will need replacing and in younger patients they may need several replacements over their lifetime. – Gum/mouth infections can occur if the veneers that are fitted are too large. If there is overhang from the veneer, bacteria can develop and cause an infection, along with soreness of the gums and swelling. – Sensitive teeth, if too much enamel is removed during the preparation procedure, teeth can become sensitive and cause discomfort. – A person may experience problems with their bite. All of these problems should be considered by a dentist when advising on veneers, and treatment should only proceed after a proper assessment and the patient receiving adequate advice, including in relation to possible alternative treatment that could be available. The Dental Negligence Team has dealt with cases where people have suffered pain and injury as a result of poorly fitted veneers. In some cases, the person should not even have had veneers fitted in the first instance as they were not a suitable candidate. People who grind their teeth are not ideal candidates for veneers and this is sometimes not explained to those wishing to have veneers, but should be so the patient is aware of the possible issues that may arise before making a decision. If you have suffered problems as a result of poorly fitted veneers, please contact me or one of my colleagues in the Dental Negligence Team, who will be happy to assist and advise you on whether you can make a claim for compensation.